Well, ladies and gentlemen, Rob and I would like to thank everybody that got involved with this blogathon, those who watched films, contributed reviews, to those who read the vast amount of reviews that came forth in this project, and to all those who took the time to share their two cents with us. 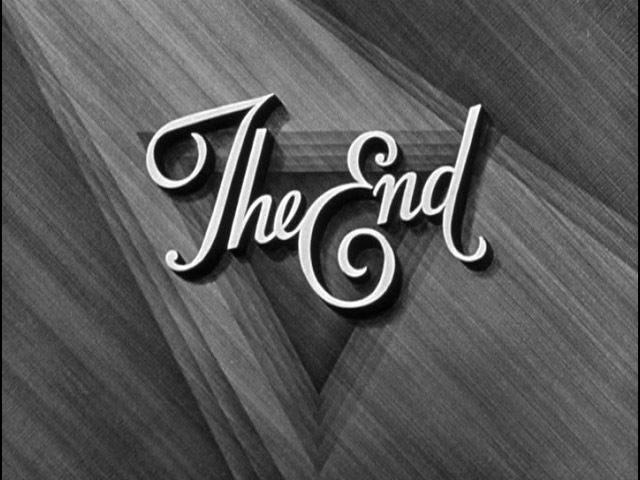 Thank you all very much for making this blogathon a success! Here are all the films that were reviewed for the blogathon, as well as links back to the respective reviews. Again, a massive thank you to everyone, you guys rock! Today I welcome Rob, my collaborator in this Alfred Hitchcock blogathon, and his final review of the films he was entrusted to watch is Topaz. Read on to find out what Rob thought of his last film! 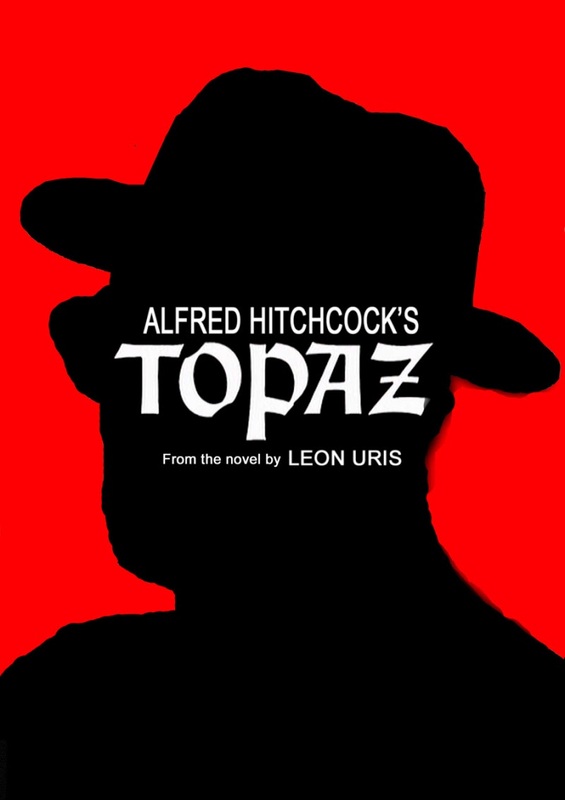 For my final review of a movie for our Alfred Hitchcock blogathon, I watched Topaz. This thriller is based om a novel by Leon Uris who wrote some great books partially based on true events including Exodus, Mila 18, QB VII, Battle Cry, Trinity and The Haj. I never read this novel, but the premise intrigued me quite a bit. The story revolves around a French spy who tries to uncover what is going on in Cuba right before the Cuban Missile Crisis in 1962. As a spy thriller the plot moves along pretty slowly but if you wait it out, you will discover some very interesting twists and turns. 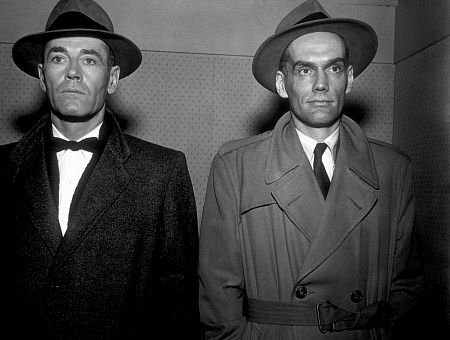 I liked the dual nature of the espionage portrayed and the fact that there were two stories taking place at once. Hitchcock who was known for not always getting along so well with his writers clashed with Uris causing him to leave mid production leaving some scenes to be written right before being shot. Hitchcock was criticized for not casting known stars on this film but I actually think that it works better this way. 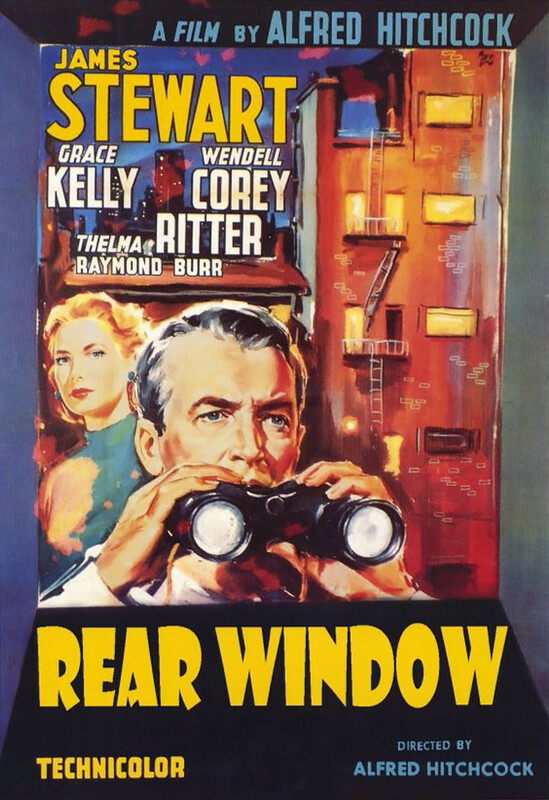 I think this kind of spy thriller worked better in the 60’s, but is still enjoyable to watch now. I think, that I’d actually be interested in now reading the novel this was based on. Ruth from Flixchatter is joining us today for our Alfred Hitchcock blogathon, having picked a movie she had never seen before. Ruth runs a fantastic blog filled with awesome content, interesting questions, movie reviews, and an array of other material. I am sure you all follow Ruth as is, but those who do not, hop on over there and get involved! Ruth, thank you very much for taking the time to venture into unknown territory for us! This review is part of this Hitchcock Blogathon hosted by Rob & Zoë. An American scientist who pretends to defect to East Germany as part of a clandestine mission to obtain the solution of a formula resin and escape back to the United States. I’ve been planning on catching up on a bunch of Alfred Hitchcock films. Now this one is perhaps one of his lesser-known films, or perhaps it’s not as popular as frankly, it’s just not a good film. The premise is actually intriguing, as I’m a big fan of spy thrillers, plus it has two famous classic actors: Paul Newman + Julie Andrews. Well, as it turns out, the film started out slow and it never really picked up. My first issue is the casting of Julie Andrews. For some reason she just isn’t convincing in this role and there’s no chemistry between her and Newman, despite the film opening of the two making out in bed. Andrews looks so much like Maria Von Trapp in The Sound of Music that it’s somewhat distracting to me, I kept expecting her to burst into song or something. Newman fares a bit better but he’s not entirely convincing as a scientist either. But the bigger issue is the lack of suspense, which in a Hitchcock film is a major no-no. There’s one fight scene that appeared in a lot of the film’s promotion, that is between Newman’s character and an East Germany officer assigned to track him down. The scene happens at a farm and there’s even a knife scene reminiscent to Hitchcock’s most famous film Psycho (1960) but again, totally devoid of suspense to me. In fact, the whole fight scene seems to have been choreographed in such an awkward manner that it made me laugh. To top it off, the two main characters aren’t that well-developed that it’s hard to feel anything for any of them. I was a bit intrigued by Tamara Toumanova’s casting as the ballerina. I knew that actress from seeing clips of her in Days of Glory (1944) which was Gregory Peck’s debut film. She looks pretty creepy in this one and that theater scene is perhaps one of the film’s most interesting but also weird scenes. Other than that, none of the cast really make an impression to me. 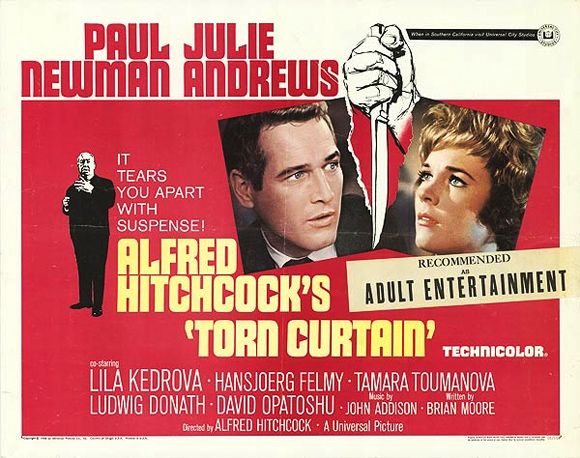 Interesting that this is Hitchcock’s 50th film, and audiences were highly anticipating this, especially since the spy genre was quite popular thanks to the release of James Bond’s Dr. No in 1962. I think the Cold War theme and story has a lot of potential but the execution is just meh. I wouldn’t call it horrible per se, but a huge disappointment considering the reputation of its filmmaker. Well reportedly the director himself didn’t enjoy making this, and clearly it showed. According to IMDb trivia, Alfred Hitchcock was so unhappy with this film that he decided to not to make a trailer with his appearance in it. I suppose even one of the industry’s greatest auteur can’t hit it out of the park every time. I’m still looking forward to his other, hopefully better films I’ve missed out on. North By Northwest is about a man who is mistakenly identified by proper bad dudes who then chase him to claim a microfilm they think he has. It might sound simple but lookout for twists and turns in classic Hitchcock style. 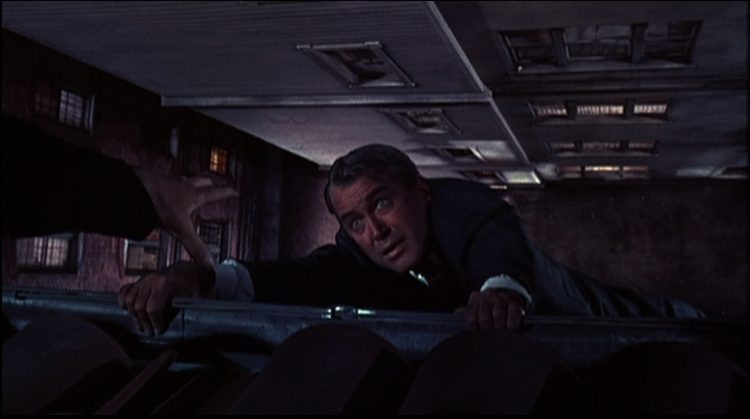 The man is named Roger O. Thornhill and he’s played by Cary Grant. It’s telling how charming Grant is that he manages to make an advertising executive likeable. Cary Grant is the epitome of style as he portrays a man in the wrong place at the wrong time. 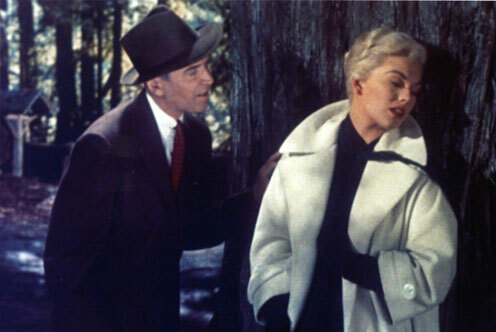 You can tell North By Northwest is a Hitchcock film due to a number of stylistic choices that are familiar to fans of his films. 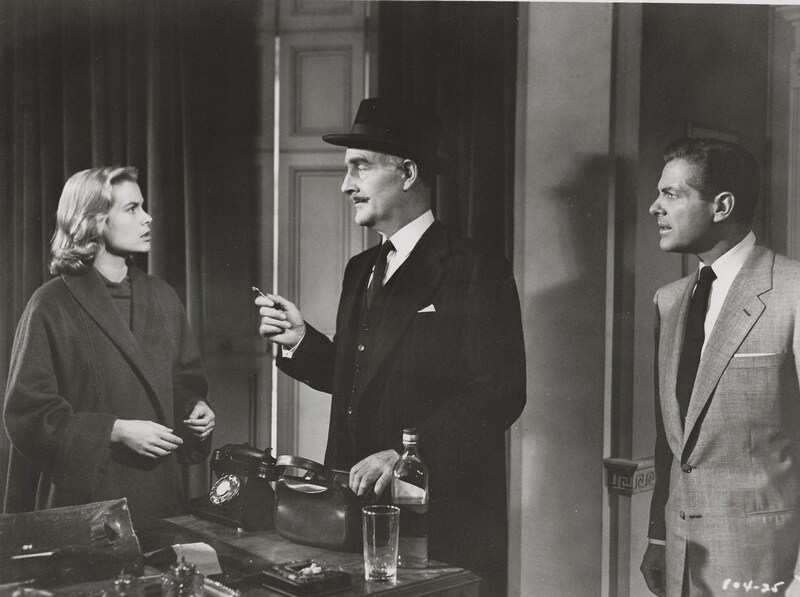 We have Eva Saint-Marie as a super hot platinum blonde mystery woman, we have a suave hero, and we have the obligatory Alfred Hitchcock cameo near the start. But this is primarily an action movie. Even if you’ve never seen it you probably know a lot of scenes from it due to all the homages and parodies over the years. The exhilarating chase scene with Thornhill being attacked by a crop duster is an iconic showdown that never loses its thrill. 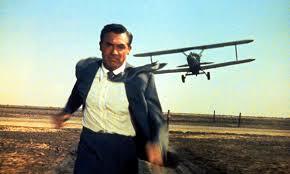 North By Northwest is an example of a director given free reign to make the film he wants. Budget isn’t a concern as he throws huge set-pieces into the mix climaxing with a thrilling showdown on Mount Rushmore. The film was once described as ‘the first James Bond film’ a claim which is obvious from the cool leading man to the exotic locations and chilling bad guy played by the legendary James Mason. Don’t know why Roosevelt looks so miserable, I’d love to have Eva sit on my face. If you haven’t seen North By Northwest then you need to remedy that quick-smart as this is Hitchcock at his most playful and populist. Watch as he lays down the template for Bond, Bourne, Reacher and any other action hero that has to look out for himself. 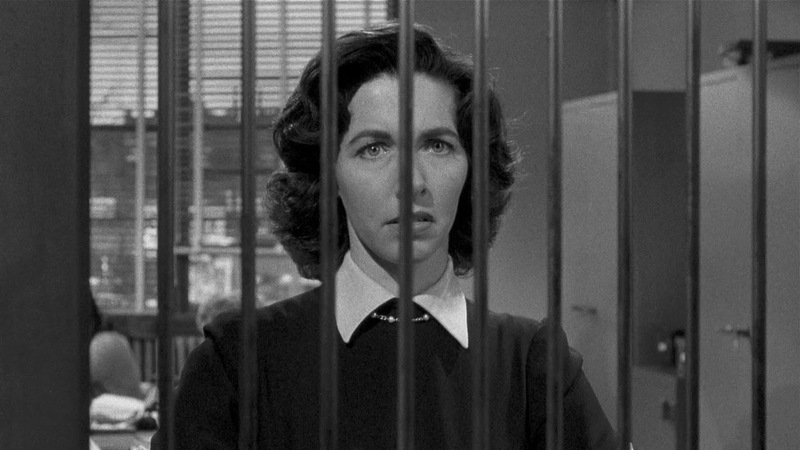 I am so thrilled today to be hosting the wonderful and delightful Cara of Silver Screen Serenade as a part of the massive Alfred Hitchcock blogathon which I am hosting with Rob. If you aren’t already following Cara, hop of over there right now, change that, then come back and read what she has to say about Vertigo. When you’re done, you can always go back and have a look see at the Shenanigans she gets up to. 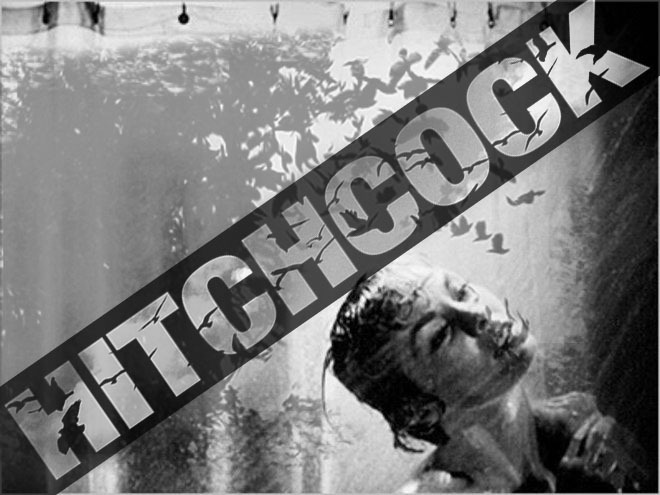 My Take On It – Hitchcock Blogathon! Let’s DO this! I was so, so excited to hear that Rob and Zoë were doing this because I’ve only seen a couple of Hitchcock films (Psycho and North by Northwest), which is kind of unforgivable for a movie buff. Or at least I guess. I don’t know the rules. Haha. Whatever the case, it was high time I got around to one or two of his other films, and this was just the push I needed to do it. So thanks, Rob and Zoë, for a brilliant idea! I have a confession to make: I’m kind of in love with Jimmy Stewart. I think I have been ever since I first saw The Philadelphia Story. Shortly after that, I watched It’s a Wonderful Life for the first time as well, and my love grew. 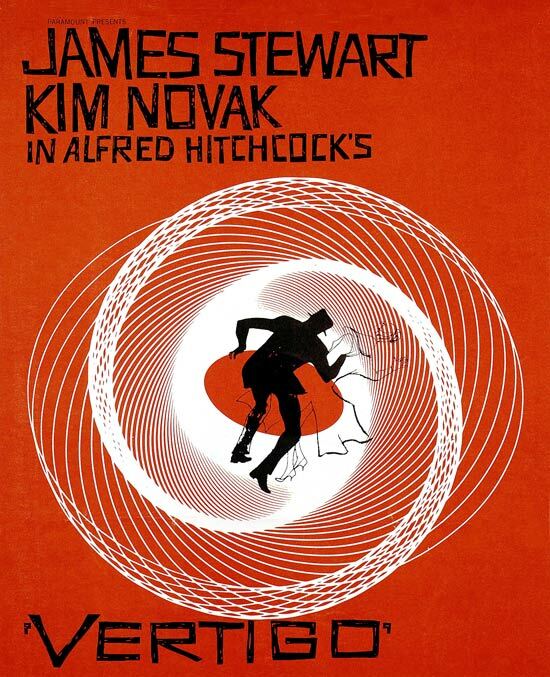 Though his role in Vertigo is much darker than the aforementioned films, Stewart is equally fantastic in it. He has this undeniable likeability in just about anything he does—no exception here. As retired detective John a.k.a. Scottie (I’m still not sure why the latter is his nickname), Stewart is just so natural and believable. Once his obsession kicks in he’s a little lot creepy, but given the story behind that obsession, it’s kind of understandable. 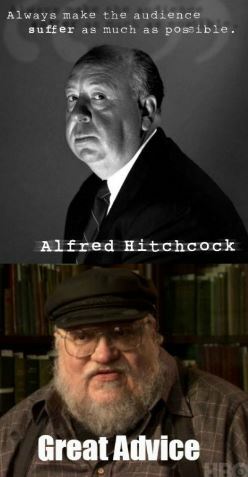 In addition to being a master storyteller, Hitchcock also has an excellent eye. The use of color and swirls in the opening credits is trippy but mesmerizing. I could say the same of a dream sequence Scottie has later in the film. And some of the shots! The ones in which Scottie suffers his bouts of vertigo are the best. Hitchcock stretches out the distant and makes you just as dizzy and nervous as the main character. The one at the beginning of the film is the best—Scottie hangs from a rooftop, watching in terror as a police officer who tried to help him plummets to his death. Simply put, it’s iconic. There are lots of moments like this throughout the film. 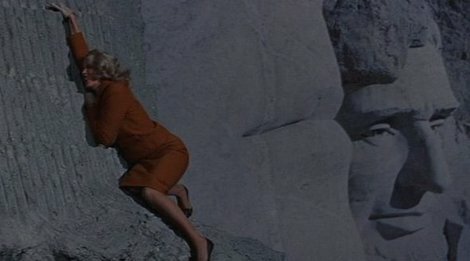 If I have to pick on some things about Vertigo, I will say that it’s fairly slow-paced, but the payoff in the end is well worth it. Other than that, my only qualms involve Scottie’s relationships with the ladies. His relationship with Midge isn’t really addressed as much as I’d hoped it would be in the end; in fact, it pretty much fizzles out as soon as he meets Madeleine, and his relationship with her is a whirlwind. He later develops another relationship that’s strained to say the least—and that’s mostly his fault since he gets a little crazy. It takes away a smidge of his Stewart charm, though not enough to make you completely dislike him. 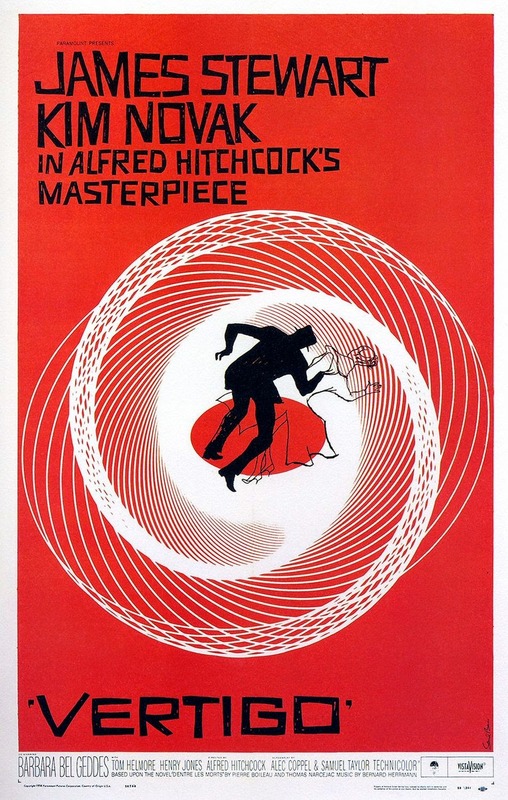 Bottom Line – Vertigo is considered one of Hitchcock’s best for good reason. It’s brilliantly woven and masterfully presented story that gets a reaction out of you. It’ll leave you guessing, and it’ll take you by surprise. Plus, Jimmy Stewart. ‘Nough said. 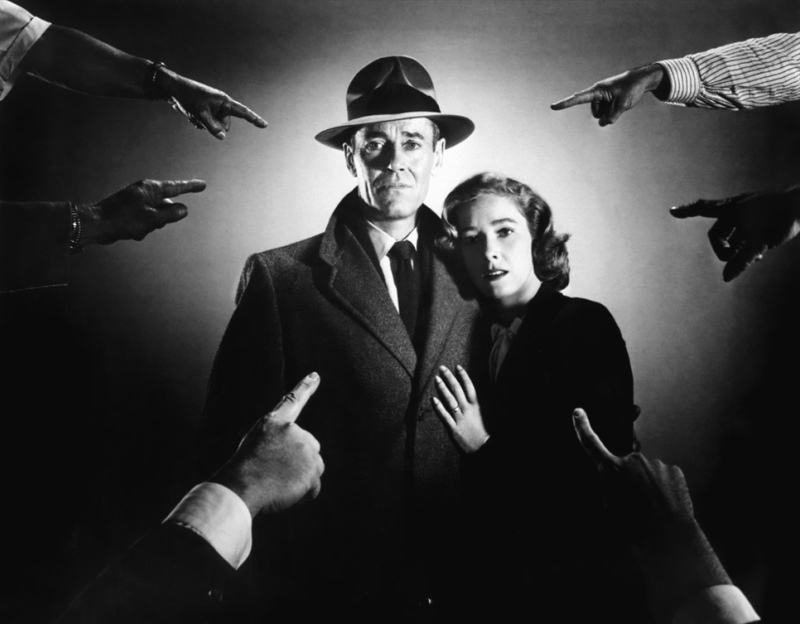 Alfred Hitchcock Blogathon: The Wrong Man (1956) – Snap Crackle Watch! To study and investigate Alfred Hitchcock’s movies, one has to imagine throwing a bunch of puzzle pieces on the table and pulling different pieces to create and shape a movie that is unmistakably a Hitchcock film. The usual elements are a story with some form of suspense weaved throughout the film, characters that are shown to be deeply and psychologically profound, a voyeuristic feel, a “MacGuffin” of some sort, the plot of murder or deceit, and actresses that were icy blonde and beautiful. 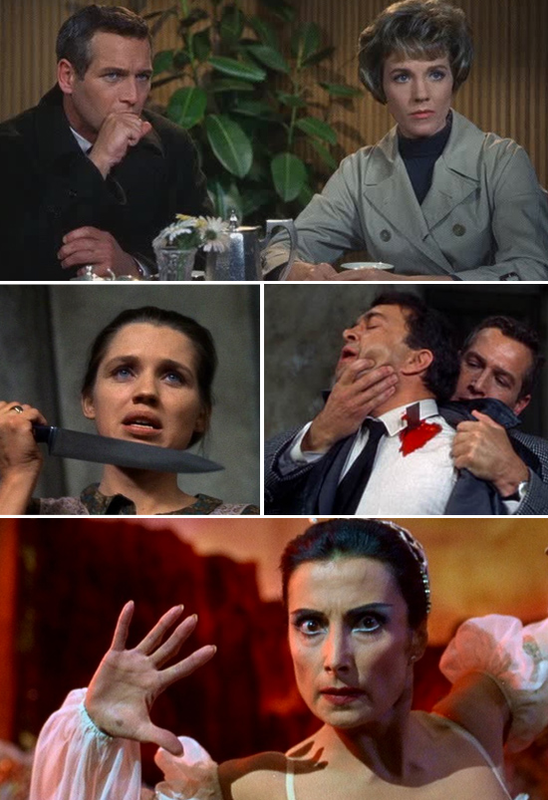 Some of his most notable films that feature these elements are North by Northwest, Psycho, Vertigo and The Birds. In his most famous films, all of the puzzle pieces come together to create a beautiful piece of cinema. 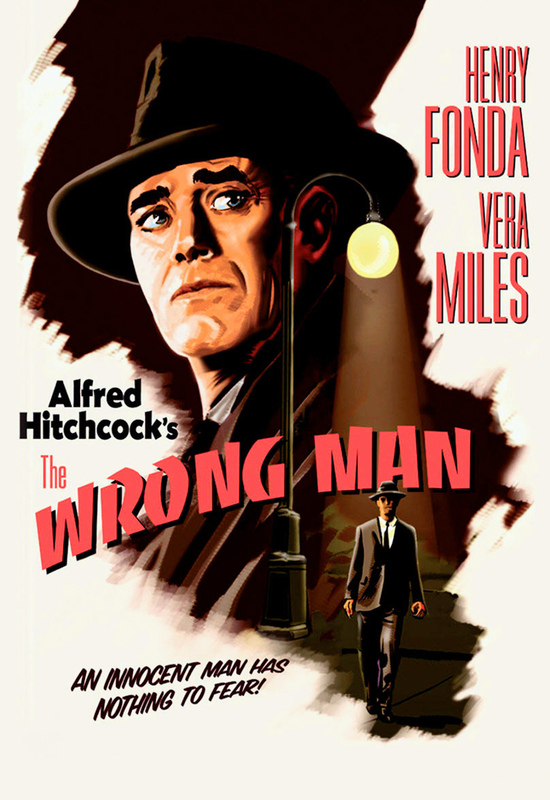 In Hitchcock’s 1956 film, The Wrong Man, he took some of his elements, but pared them down and gave the audience a much more subdued version of his usual type of film. In the mid-fifties, he was in the thick of Alfred Hitchcock Presents and this movie feels like just a longer version of one of those episodes. At the time he owed Warner Bros studios one more film and this is the one he chose to make. 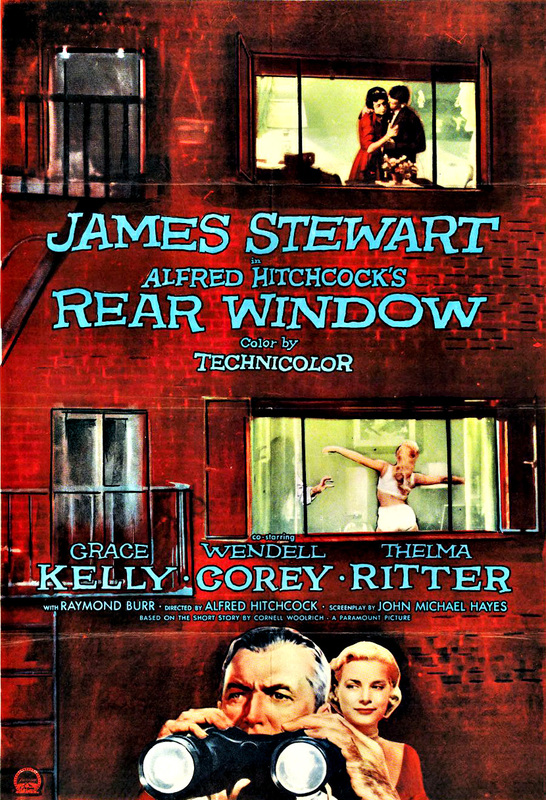 It is notable to understand that after this film, he created one of his best films ever, Vertigo for Paramount Pictures, so perhaps he was saving something much better for his move to a new studio. 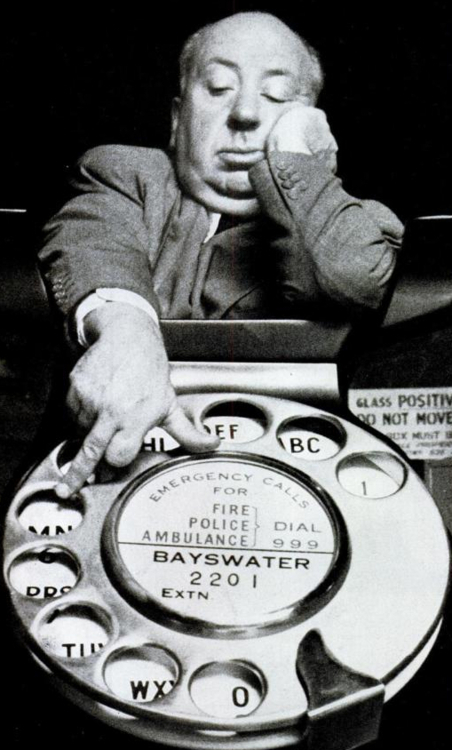 In the beginning of the movie, Hitchcock tells the audience what they are about to see is a factual story; he says “every word is true.” This beginning monologue is the only time we see him in the movie; he usually made an infamous appearance in his films, always in the background of some sort, as a train passenger, a person waiting for a bus or someone walking around a store. The fact that he chose not to make this move, only serves to reiterate the fact this film felt like a story out of Alfred Hitchcock Presents. 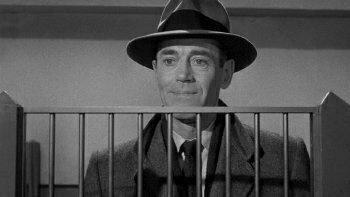 The story is about Manny Balestrero (Henry Fonda), a musician who plays jazz in New York’s Stork Club and who works diligently to make ends meet. 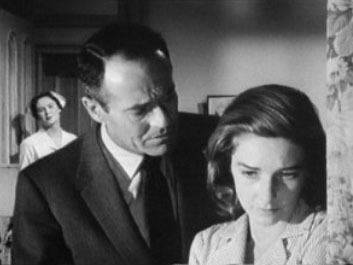 His wife Rose (Vera Miles) at the same time is sick at home and needs to have her wisdom teeth pulled, but they do not have enough money to pay for the procedure. He has already taken money out of life insurance policy to pay bills and they must now resort to taking money out of wife’s policy. When he goes to the bank to do the transaction, the tellers get really nervous and freak out and alert the police. They believe and are certain that he is the man who had recently held up their bank. When the police apprehend him, they also are under the suspicion that he not only held up banks, but had help up a deli as well. They put him through a string of reenactments; they make him walk in and out of the deli in question and subject him to handwriting analyses. Without a doubt everyone believes it was him who did it. During this tumultuous time, his wife has a mental breakdown as she believes she is the cause for all this that is happening to him. To be succinct, Manny hires an attorney who helps him investigate and prove his innocence. When the robberies had occurred, he was actually out of town and he and his wife search for witnesses, but keep coming up short. It feels like the world is against them and with every wrong turn, Rose collapses deeper into despair. He is forced to put her in a mental hospital, so that she can get better. Eventually the real perpetrator is apprehended and it is obvious to everyone that he looks just like him and Manny is cleared of his charges. Despite being cleared, the person left the most hurt and psychologically damaged is Rose. 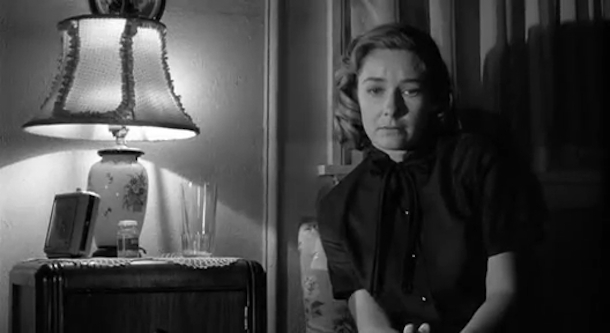 She is really the poignant part of the story and her collapse truly lends to the Hitchcock element of the film. The shots of her in her deepest moments of despair, she appears almost catatonic, are close-ups in a room, with a single shot of light coming through the window and a mirror appropriately placed near her. This reminded me of the scene in Vertigo where Judy (Kim Novak) realizes that Scottie (James Stewart) is just trying to dress her up and make her look like his long lost love. The whole scene is just as creepy as that one and they both encapsulate the feeling of catatonia that is very much distinctly Hitchcock. The movie ends on a somber note, Rose is still in the sanitarium, but then quickly as the film is about to end, we see the family walking off happily and we are presented with the fact that Rose later got out of the hospital and they lived happily ever after. I thought the presentation of that was pointless and it felt strange, after everything that happened to just throw a “happily ever after sticker” on it, seemed rushed and emotionless. The film utilizes many POV shots to get the point across and to help the audience feel the anxiety and nervousness that many of the characters are constantly feeling. For example, when the teller looks at Manny and thinks he is the robber, the camera goes back and forth from her face to Manny’s perplexed feeling as to why he is being looked out so oddly. The music also plays a big role in the film, many times it feels ominous and scary like when Manny is in jail and is confused as to why he is being singled out. Also, Manny’s jazz music is dispersed into the film and this adds to the heightened, frenzied emotions in the film. Fonda and Miles did a great job with their roles and really seemed to have searched deep to portray such psychologically tormented people. I am surprised that Fonda never appeared in any more of his movies, considering what a tremendous job he did. Miles was slated to become a big start after this; she did go on to star in Psycho years later, but her run as the next Grace Kelly was over before it started. I could go on and on about this and give you guys even more info, but then this will get extremely long. 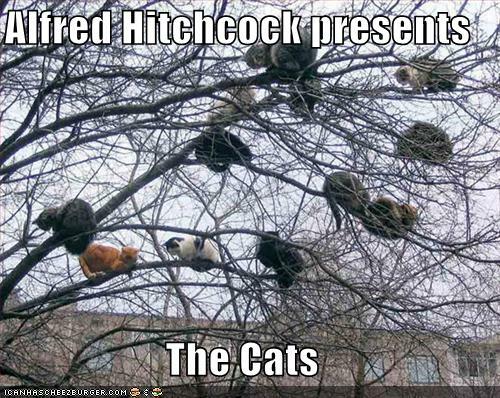 Overall, this was not one of my favorite Hitchcock films. I felt that the story was rushed and almost a copied version of the many thriller movies that evaded that time. Regardless, it is a Hitchcock film and if you haven’t seen this one already, it is worth giving it a watch and putting it under your belt. Personally, if you are new to Hitchcock I would not start off with this film. I would start off with Strangers on A Train (my fave), Notorious, Shadow of a Doubt or Rope as your introductory films into the Hitchcock repertoire. Happy Hitchcockian watching! One of his best films to date. Hello all! Thank you for returning, time and time again, for some more Hitchcock films and the reviews. 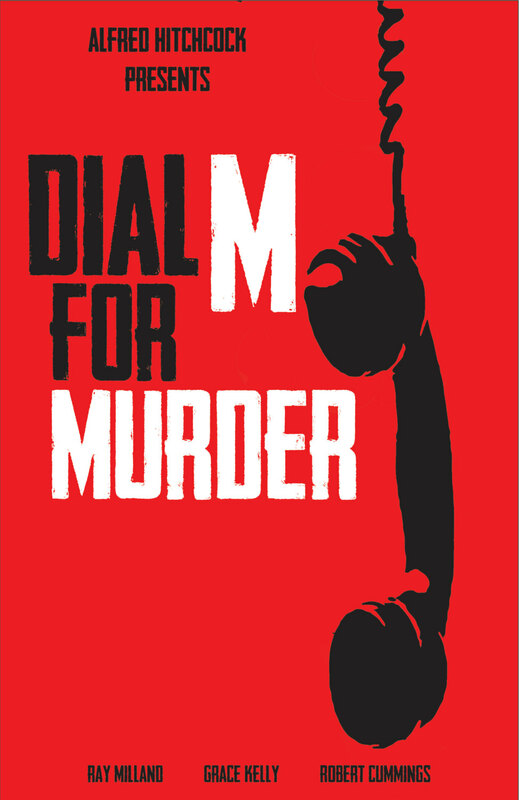 Today I have another one that I have always heard about and have been meaning to check out: Dial M For Murder. This blogathon showed that it was time, so I finally got to cross another movie off of my list. 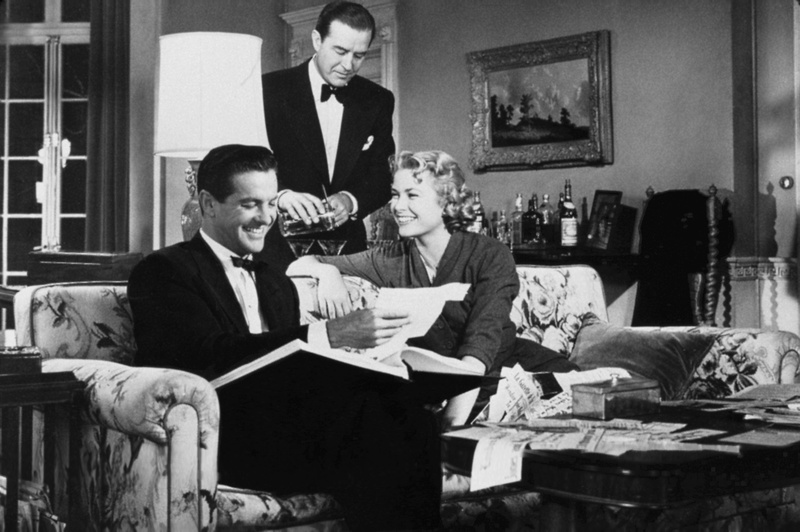 Dial M For Murder holds your attention for the duration of it. It starts off rather suddenly, but precisely where it needs to. Bear in mind, this was adapted from a play, so it means that the set is not huge, and it is something that Hitchcock pulls off exceptionally well. I was happy to see cutie Robert Cummings featuring again, and I must say that he impressed me again. Grace Kelly was such a stunner, and I thought that her and Cummings made a beautiful couple. So when the movie kicks off, we learn that Margot Wendice (Grace Kelly) was cheating on her ex-tennis star husband Tony (Ray Milland) with mystery writer Mark Halliday (Robert Cummings), though the two had called it off a year ago. However, with his return, it seems that the feelings are not dead, and the two are in love, though she is unwilling to leave her husband. Tony seems much in love with his wife, who appreciates that he finally made her front and centre of his life, and Tony and Mark seem to get along relatively well too, all things considered. Tony befriends Mark, and before one can get too indignant about a cheater befriending the husband of the woman he loves, Tony sends Mark and Margot off to the theatre, and then meets with a crook named Captain Lesgate (Anthony Dawson), a man he convinces to murder his wife for a thousand pounds so that he, Tony, can receive her sizable estate when all is said and done. He also thinks he has the perfect murder thought out, and ensures that he is at a stag party with Mark when it all goes down, giving him the perfect alibi. Naturally, things go wrong, and Margot survives, and Tony needs to change things around quickly, changing the nature of the evening, and Margot is painted a murderer and sentenced to death, though Mark refuses to accept that. It was very interesting for me to see how Tony went about his planning, and how perfect it all was in his mind, but it honestly did not really account for anything changing. There were reasonable explanations for all the whys, but there was not contingency plan so much for any other wrinkle, and goodness, were there wrinkles when this plan got underway. Never mind the fact that Margot was unfaithful, it seemed evident that Tony had never put her first in his life until it was apparent to him that he very well may lose his meal ticket, and then he went for drastic measures. The acting was pretty good for this, and everyone did their bit to convey their part. I liked Chief Inspector Hubbard (John Williams), he was sharp and certainly thought outside the box, even though he was doing everything by the book. I definitely thought this to be one of the better Hitchcock films I have watched throughout the course of this blogathon, I certainly got a handful of less than stellar outings. Alfred Hitchcock certainly improved over time, and this was another film to showcase that. The plot was pretty good, nothing revolutionary per se, but gripping enough to hold your attention, and the movie did not feel very long, though it comes in at 105 minutes. The plot is simple yet commanding, interesting without being too complex, and even though everything goes down in one room, that never becomes a drag or an issue, or something I really paid attention to at all. The cast carried this film incredibly well, and should be commended for that. 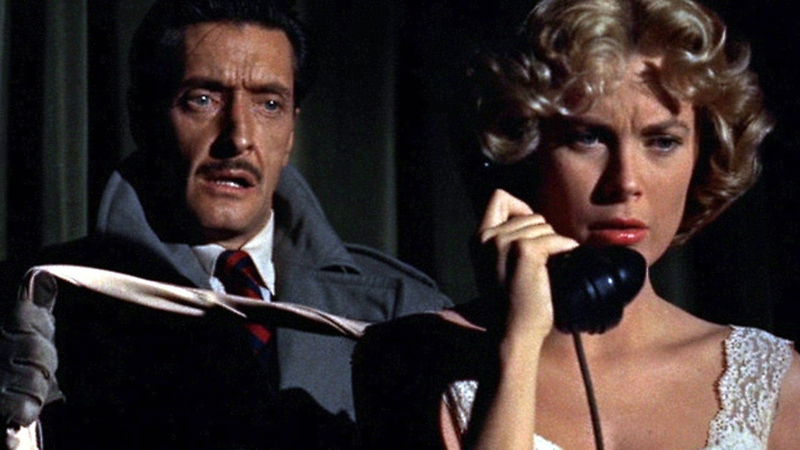 I could recommend Dial M For Murder as a pretty good mystery thriller, it came together well, was well constructed, and interesting at the very least, if not only to see how Tony’s perfect plan A suffered, and how he desperately needs plan B to work without a hitch.